Wrapped around the second-floor bar area and overlooking the billiards hall floor, our L-shaped landing seats 50 for dinner or 75 for cocktail receptions with hors d’ oeuvres. In the evening, it shares the energy and atmosphere of the billiards hall, but lets you feel tucked away in a semi-private space. 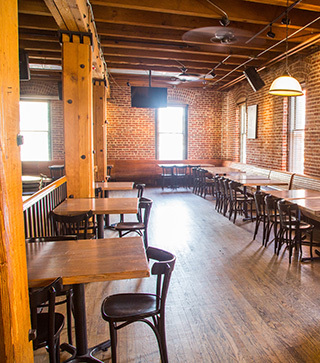 The Landing is a fan favorite for happy hours and team building events. Also available for daytime gatherings. Half-landing may be reserved on availability. All guests must be at least 21 years of age after 6:00pm.